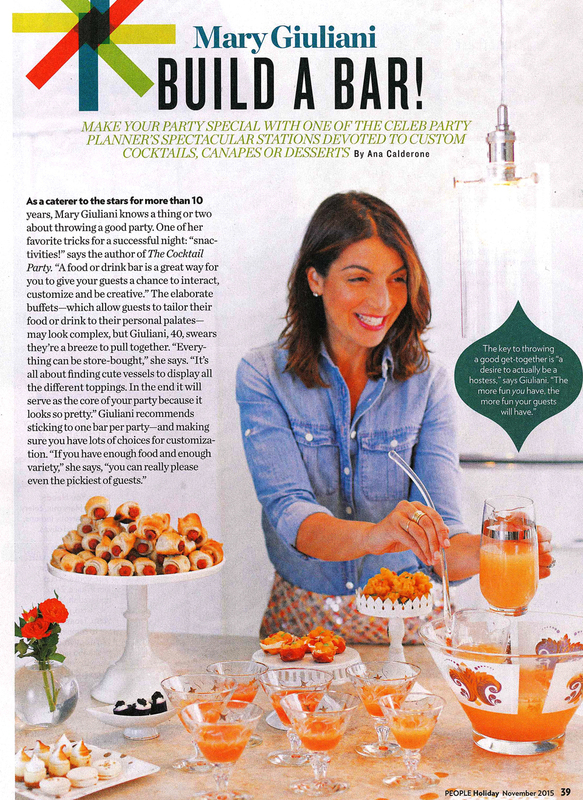 The latest venture from Mary Giuliani and team…The Pennsy will be a delicious NYC locale to sample some of the fabulous bites made famous by Mary in her new book “The Cocktail Party” — grab your copy today — the perfect source for the easiest yummiest tips for holiday entertaining! Almanac Weekly: Eat. Drink. Play. Recover. 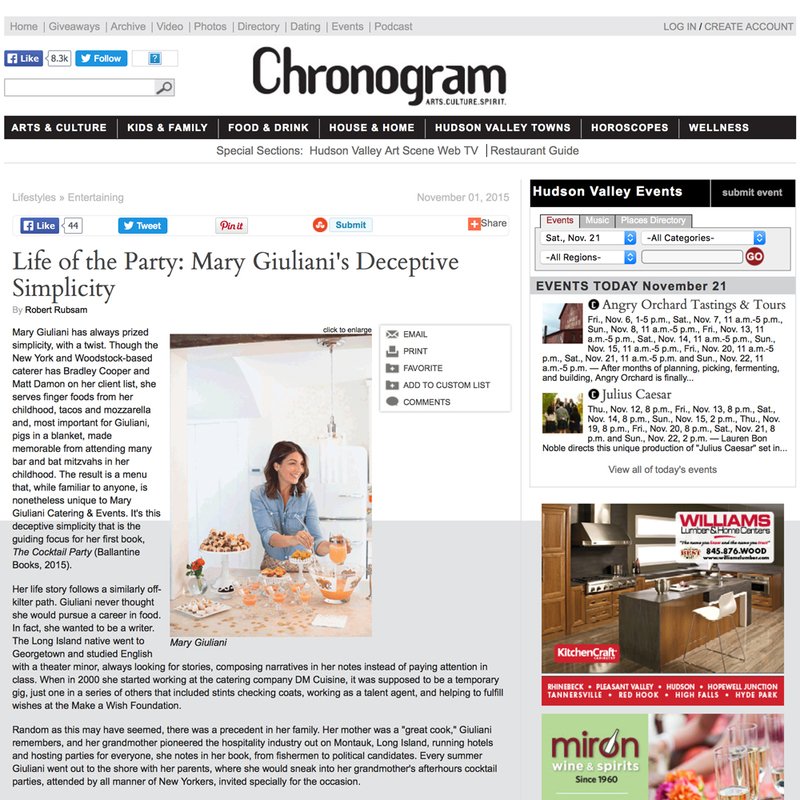 She’s known as “the caterer to the stars,” and her website indicates a dedication to a “creative, boutique, customized approach to high-end entertaining.” Don’t let these superlative descriptors belie the fact that Mary Giuliani’s approach to throwing a perfect party – no matter if it’s small, large, high-end or down-and-gritty – is totally approachable. In fact, she insists on it being fun. Her new book, The Cocktail Party, is proof that this party girl’s mission is for you to have a good time entertaining your guests. 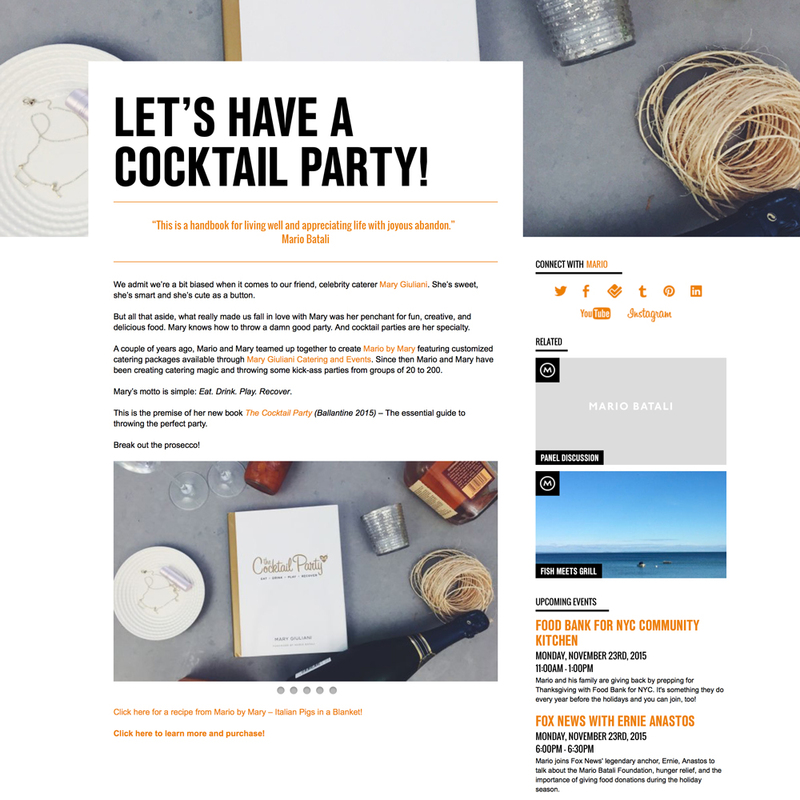 To toast to the launch of Mary Giuliani’s new book, The Cocktail Party: Eat. Drink. Play. 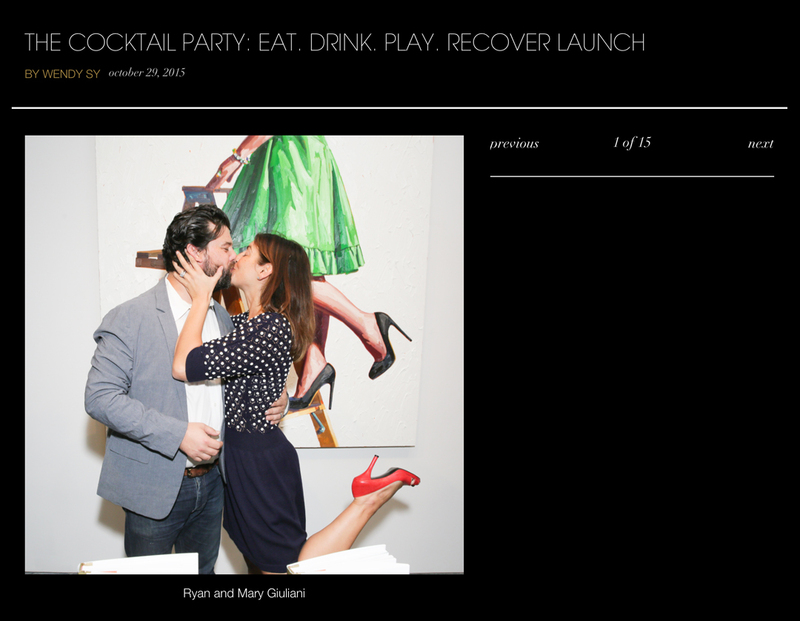 Recover, a cocktail party was held last night at De Buck Gallery. As a seasoned party and lifestyle expert who owns her namesake catering and events, Giuliani’s book is about what she knows best: creative and unique approaches to entertaining. 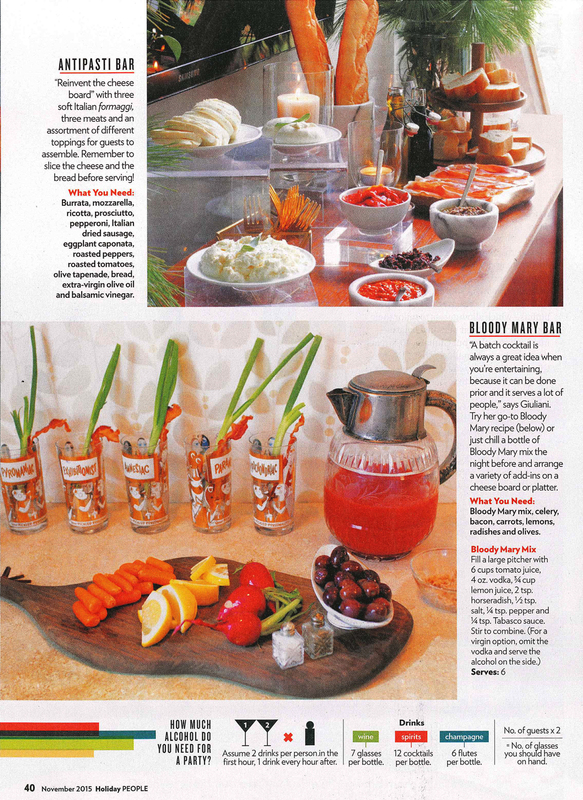 In addition, The Cocktail Party: Eat. Drink. Play. 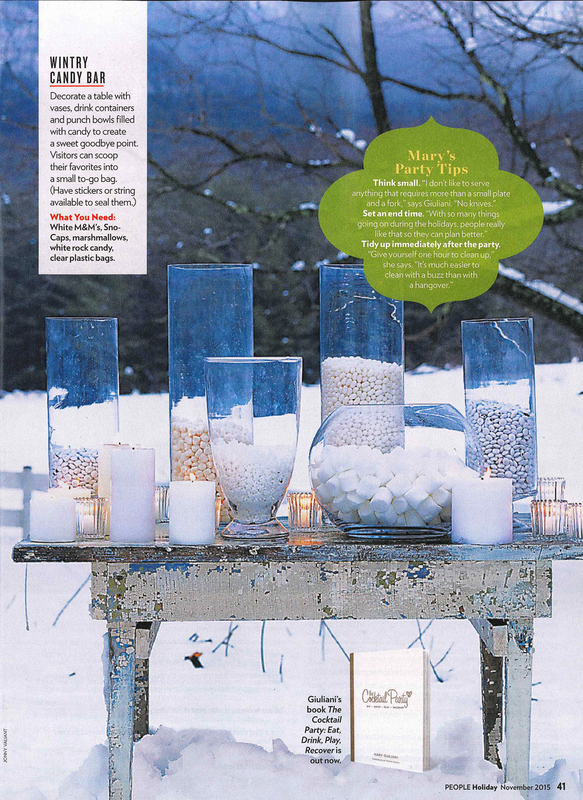 Recover includes plenty of recipes from sweet mini pumpkin muffins to chicken satay and edamame dumplings. Guests relished the evening and enjoyed light bites and champagne while checking out the latest read. Those in attendance included the author’s husband, Ryan Giuliani, as well as Robert Jarmain, RJ Konner, Celia Austin, Jay Alaimo, and more. Mario Batali: LET’S HAVE A COCKTAIL PARTY! 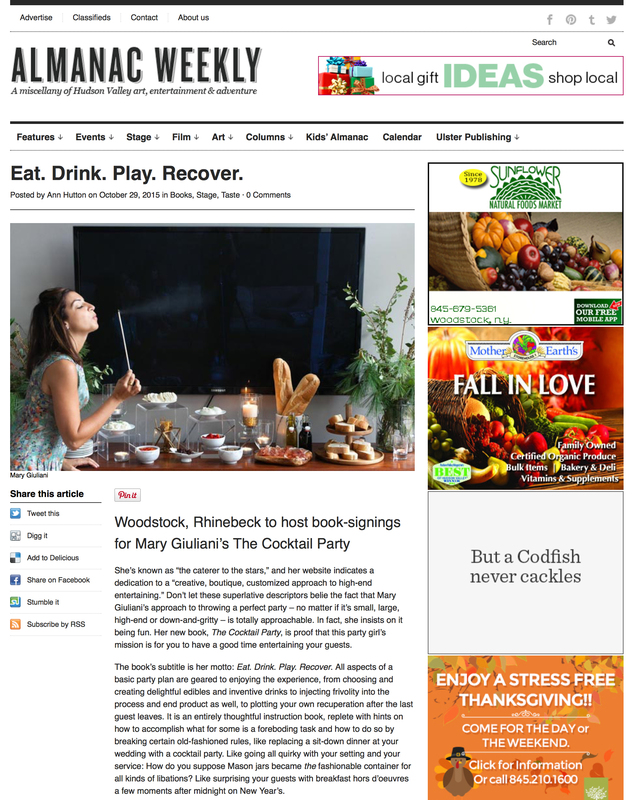 If you’re thinking of throwing a party for the holiday season, you might want to include Mary Giuliani — or at least her sassy, stylish new book, “The Cocktail Party: Eat, Drink, Play, Recover.” This play-by-play guide by the Woodstock resident, lifestyle expert and A-list caterer (think Rolling Stones, Bradley Cooper, Stella McCartney, among many others) features fun recipes for entertaining, from classic cocktail parties to an “anything-but-average afternoon baby shower.” Each of her party themes — Christmas, Game Day, Awards Season, Surprise Party, Garden Party, Weddings and more — include a whimsical “Snacktivity” to turn favorite foods into something out of the ordinary (soup-sipping station, DIY grilled cheese setup and frittata bar, as examples). Her playful approach to making small bites and big drinks are bolstered by fanciful illustrations by Jason O’Malley, a Kerhonkson artist who has more than 12 books to his credit, and creative photography by Adrien Broom. In the forward to the book by Mario Batali, with whom she has collaborated on the venture Mario by Mary — seasonally inspired Italian dishes developed by Batali and executed by her team, Mary Giuliani Catering + Events — he calls it “a handbook for living well and appreciating life with joyous abandon.” Giuliani, who will be in Rhinebeck Saturday for a book signing and tasting event, recently took time to answer questions about her first book and her method for creating all-star events that anyone can put together. Why did you decide to put together “The Cocktail Party” at this stage in your career? I always wanted to be a writer. I studied English and theater at Georgetown University, so storytelling has always been something I wanted to do. I felt it was time to pass along some really helpful entertaining shortcuts, tried-and-true party recipes and share my stories about how dreams can come true … even the ones you didn’t know you wished for. Mary Giuliani has always prized simplicity, with a twist. Though the New York and Woodstock-based caterer has Bradley Cooper and Matt Damon on her client list, she serves finger foods from her childhood, tacos and mozzarella and, most important for Giuliani, pigs in a blanket, made memorable from attending many bar and bat mitzvahs in her childhood. The result is a menu that, while familiar to anyone, is nonetheless unique to Mary Giuliani Catering & Events. It’s this deceptive simplicity that is the guiding focus for her first book, The Cocktail Party (Ballantine Books, 2015). Random as this may have seemed, there was a precedent in her family. Her mother was a “great cook,” Giuliani remembers, and her grandmother pioneered the hospitality industry out on Montauk, Long Island, running hotels and hosting parties for everyone, she notes in her book, from fishermen to political candidates. Every summer Giuliani went out to the shore with her parents, where she would sneak into her grandmother’s afterhours cocktail parties, attended by all manner of New Yorkers, invited specially for the occasion.